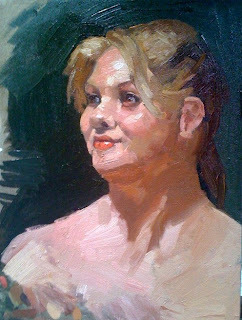 Day two from David Leffel's workshop.Tomorrow we will have a new model so no chance finishing this on. I like it just the way it is, D. Great piece! Great! How did you like the class? Thanks John. I loved the class. David is an amazing painter. This is beautiful! You must be having so much fun pushing real paints around! Dorota, this painting looks like a master painter did it and I was right. thanks Greg. I have so much to learn but good to hear words of encouragement.